I was going through a box of 9/11 materials and I found this photograph that Department of Housing Preservation and Development staff photographer Larry Racioppo had taken of me. I don’t think I’ve looked at it in 10 years. Not a comment on the photograph, which I love (thank you, Larry). 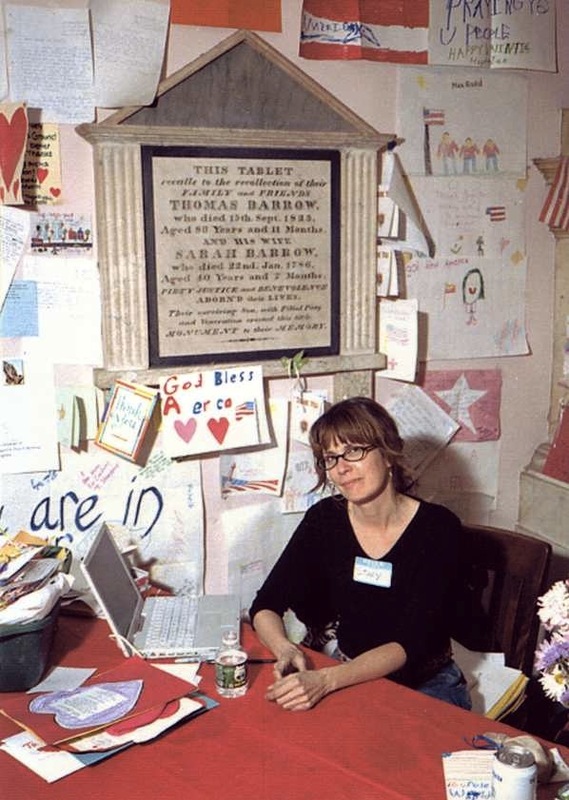 I had set up a table in the back of St. Paul’s Chapel to provide an area where the rescue and recovery workers could send thank you cards and letters back to all the kids, and people and companies that had written or sent stuff that was needed. Often by the time the letter got to us the envelope was missing so I brought my computer in every week in order to track down addresses. I’m going to try not to be all 9/11 all the time for the next few weeks! But obviously it’s coming up a bit because of the 10th anniversary. With all that they were going through and all that was going on, they wrote thank you letters? Wow. We don’t mind you telling your 9/11 stories. I’m interested in reading your 9/11 stories, too. Only if you want to write about it, though. That’s nice of you both. I just figure most people are thinking “enough already with 9/11,” which I kinda feel too, I must admit. But the 10th anniversary is another story. In July of 2002, a friend and I flew to New York on a small, commercial jet. While circling, waiting our turn to land at LaGuardia, the pilot tilted the plane so we could see the cleared 911 site. We were stunned – we had no idea of how large the Towers “footprint” was. Neither the pilot nor any of the passengers said a word. There was nothing to say. I’d love to read your stories from that day.